"The property was very clean, comfortable and well equipped. The kitchen was well laid out and having the extra toilet downstairs in the laundry was convenient. 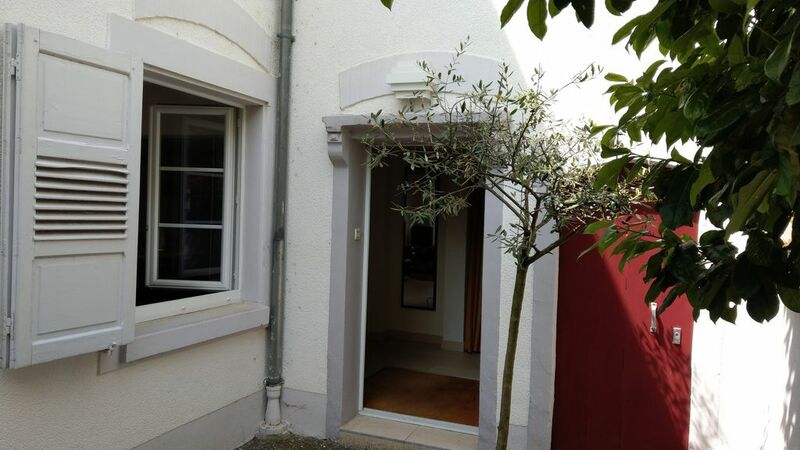 The location of the property was very quiet and pleasant but close to local shops and restaurants, post office, banks, bus into the city of Strasbourg (a ten minute ride or so and a very good service even at the weekend). Instruction books for all the equipment in the property were supplied. Supplies of dishwasher and washing powder were provided, which was very welcome for short stay guests. It was very pleasant to stay in an older area with the combination of very old buildings but all the modern facilities required, a part of Strasbourg but a bit separate as well. Connections to other interesting towns in France and elsewhere for day trips was easy from here by getting the bus to the city centre and the tram one stop to the main railway station. I would definitely stay here again and recommend this property to anyone else." "A very nice apartment in a great location, well away from the typical tourist areas. It was exactly as described and pictured, located in a nice neighborhood with a short walk to shopping and an excellent bakery virtually around the corner. A short walk to the tram line provides for an easy and inexpensive link to anywhere in Strasbourg. The owners were prompt in reply to email, very friendly and welcoming. Highy recommended." Nous sommes arrivés avec le désir de pouvoir nous reposer, de vivre quelques jours de détente dans la discrétion silence, le calme. Et nous avons été largement combles. Cuisine très bien équipee. Literie impeccable salle d’eau salle de bain et autres lieux de séjour bien chauffés ce qui est appréciable en ce moment d’hiver. On aurait envie de prolonger... mais... le soleil de notre pays d’origine nous attend et, accessoirement nos activités. Merci aux propriétaires pour leur accueil. Peut-être reviendrons-nous? Très bon rapport qualité prix, très propre, plus que conforme aux photos. "It was perfect! Clean, convenient, spacious, great amenities. the neighborhood was very calm. Close to a tramway station. Organic supermarket (serpent vert) in the nearby. I would recommend this place to everyone! a great place to stay for your home away from home! Landlords were wonderful! they went out of their way to make us feel at home and comfortable." "Excellent sejour prolongé (un mois de demi). Le logement est parfaitement équipé, excellent niveau de confort. Quartier calme et tres sympathique. Les propriétaires sont agréables et discrets. Nous vous recommandons cet appartement les yeux fermés!"